Why do we wax our cars? Well, wax is a durable layer that protects your paint, as well as providing gloss and shine. Because it’s the outermost layer on your vehicle, your wax takes the most beating from chips and dings, weather, UV rays, road dirt and grime. To protect your paint and maintain your paints gleam, wax needs to be replaced every so often. 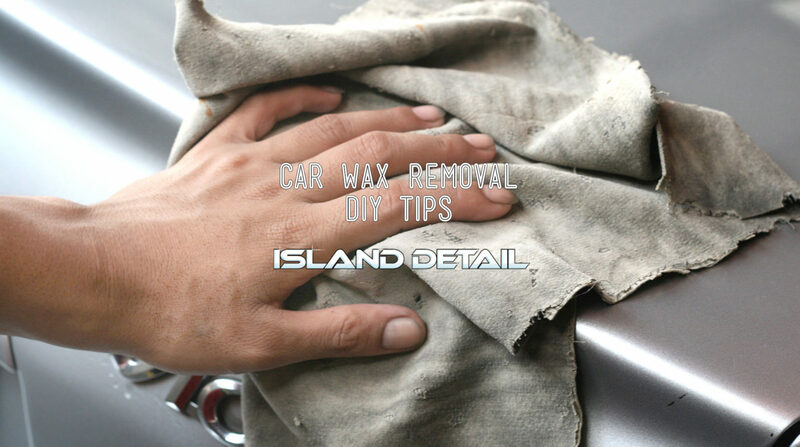 To properly wax your car, you should strip the old layer of wax off first. Adding new wax on top of old grimy wax is like painting over a hole in your living room wall. It doesn’t hide or fix the problem. If anything is left on the paint prior to the new waxing application, the protectant will not bond properly and durability, protection, and gloss will suffer. Before you start de-waxing, wash your entire vehicle. After that is done, then you can attack the wax. Many online sources recommend just an isopropyl alcohol (IPA) wipe-down to remove wax. Depending on how thick the layer of wax is on your vehicle, you may need to apply IPA multiple times to fully strip the vehicle, which wastes product and time. We recommend a degreaser to cut through the slick layer of wax, such as a non-abrasive polish or wax remover to remove previously applied waxes, contaminates and sealants. You can apply the non-abrasive polish by hand or using a machine- it’s the method most auto-detailers use. Spray on/wipe off wax remover products are available, but we don’t recommend this avenue. Spray on wax remover will chemically strip the paint of all previously applied waxes and sealants but don’t reach hardened contaminants. We’ve heard of people using household dish soap to remove wax, and while it can strip your car of wax we encourage you to leave the Dawn in the kitchen. Dish soap should never be used on a car, it’s degreasing properties can permanently damage your trim and will dry out the paint. Use a product that’s formulated specifically for car paint, followed by that IPA wipe down. Isopropyl alcohol has degreasing and cleaning properties, and will remove any residual product and neutralize the paint. After the IPA wipe, your vehicle will be ready for you to apply your wax of choice, which you should do as soon as possible to ensure your vehicle is protected. Removing old wax is the most important step to prepare your car or truck to receive a layer of new wax and look its best. Be sure to use these guidelines and recommendations the next time your vehicle is due for a wax. Or, of course, give us a call, we do this every day and have it down to a science.